Cinematic brand alignments, at the end of the world. I’ve worn Oakley glasses for a long time. In fact, at the last adventure, I lost my last pair — which have probably been around the world at least twice. To the end of considering brand relationships, at least to eye wear, that’s the brand that I’ve been linked to, forever. The lens in those frames were changed, for free, by Oakley at least three times. Some where, I think there’s another pair out there. But the conceptions of strategy as a brand — Oakley stands in a class all its own. Perhaps like Nike’s positioning, with Phil Knight‘s expertise as a marketer (and a runner,) leading the drive of Nike, the founding director of Oakley is an industrial design. And design drives everything at Oakley. 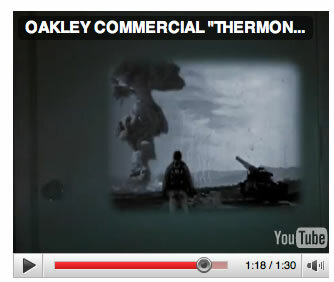 Given the spate of product placements that have aligned Oakley with a kind of industrial strength positioning, it’s perhaps relevant to recall the earlier promotion of Oakley — “thermonuclear protection.” The nature of all the films that Oakley has linked itself to, speak of world-ending scenarios. Or, at the least, storytelling that pits the protagonist against martial odds of enormous order. The most recent of which is “Green Zone,” Matt Damon’s story of the American incursion in early Iraq, search, destroy, shock and awe — as well as build (and his uncovering of) the lie — of the undiscoverable “weapons” that catalyzed the war. 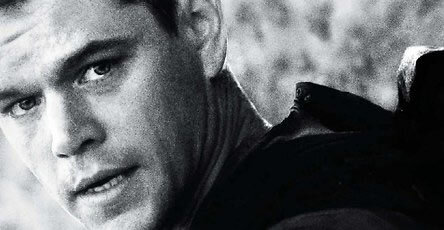 To Oakley’s tactical overview, “There may not be a more perfect cinematic representation of the Oakley spirit than Matt Damon’s performances in the edge-of-your-seat triumvirate of Bourne movies. Car crashes, beat-downs, shooting bad guys, running his tail off…the guy is just fierce. In his new film “Green Zone,” Matt stars as Chief Warrant Officer Roy Miller, a rogue U.S. Army officer who must wade through covert and faulty intelligence hidden on foreign soil as he hunts for weapons of mass destruction (WMDs) in an unstable region. 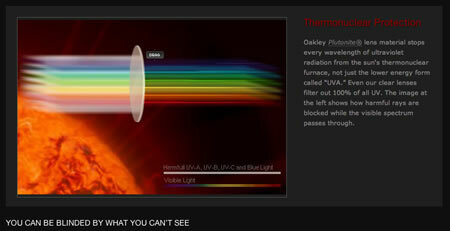 Moving back into 2009, there were two other films that utilized Oakley products. 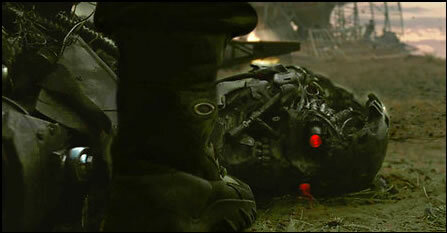 The film “Terminator Salvation” expressed a move into the territory of James Cameron’s end of civilization as we know it, “Terminator” cinematic storytelling. In this narrative positioning, machines rule the world, and John Connor is the savior to lead that fight. Still another post-apocalyptic thread, adhering to the early red line of Oakley’s “thermonuclear protection” theme is Denzel Washington’s “The Book of Eli.” According to the New Yorker’s abstract of the review by David Denby, “Denzel Washington plays a post-apocalyptic warrior, Eli, who has been walking west for thirty years through a devastated landscape, carrying a sole book, a Bible. Along the way, he fights off cannibals, marauding motorbikers, and other people. It seems that years ago there was a war, and then a “flash”; the ozone layer was destroyed, and the sun “came down” and dried up everything. 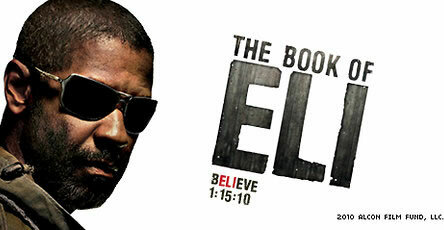 Eli was led to the Bible by a “voice” that took control of him.” Trailers here. 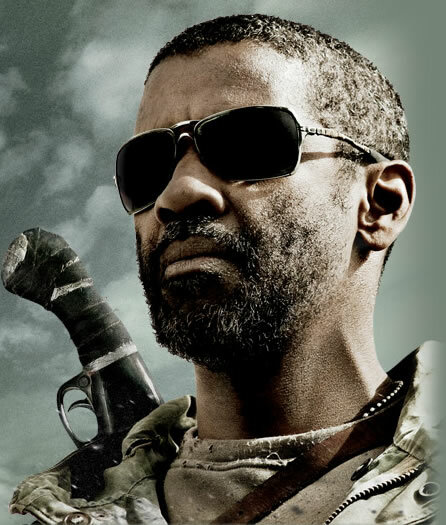 In this portrayal, the product in play are the Oakley Polarized Inmate® glasses. The striking linkage between an earlier positioning of thermonuclear — and atomic protection still finds its presence seen in play today — in online ads as well as the site itself. In this context, to the modeling of filtration, there’s the promotional imagery that relates to nuclear. And the concept of the solar furnace. and the UV rays that the glasses will protect the wearer from. What I find interesting about these links lie in the soul of the brand — Jim Jannard, the inventing founder of the company — and his personal renegade, part-artist, part-mad scientist, positioning; it’s this genetic code that created the opening strategies of marketing the glasses as being protective from annihilating blasts; and in a way, this legacy is carried through, the marketing still in place, though tinted differently from the earlier expressions. The idea of a eccentric founding philosophy — generated in the heart of the human brand — still binds to the coding to be held in a kind of mythic legacy, ever-continuing. And Jannard’s philosophy is a winning proposition, his compulsive drive to building products founded on extraordinary design and technology, ever moving the company forward, even after its sale to Luxottica. Brands built by humans, for humans, even at the end of the world.